Christmas presents all bought and ready to send, but for whatever reason DHL need to inspect a package before accepting it for delivery which rules out wrapping paper. I’d seen various mentions of re-useable gift bags and I remembered I’d bought some tea towels a few weeks ago and so an idea was formed. Something quick and easy as I needed to make a few before tomorrow so I ran up a few of these. 1. Cut a tea towel in half, my tea towels were 28 x 20 inches so I was left with a rectangle of material measuring 14 x 20 with only 1 unfinished/cut edge. This size will make a drawstring pouch that’ll hold a book/dvd/toiletries or other similar sized items. 3. Fold over the edge and stitch to form a channel which you can pass your ribbon/tie through. As mentioned previously, the buttonholes you have just sewn should be on the outside edge of the channel. 4. Fold the material in half so that the short edges meet, and the ‘wrong’ side of the fabric is on the outside. Stitch along the edge to make a tube. Then stitch along the bottom to close the bottom of the bag. 5. You can skip this stage depending on the item you want to go in your bag, flatter items such as books do not need this stage. 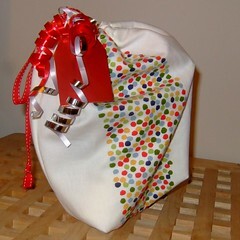 Form box corners a the bottom of the bag, choose whichever size you prefer. 6. Use a safety pin to thread your chosen ribbon in through the button hole, along the channel and out through the second button hole. You’ll need a pair of socks (preferably with contrasting heel and toe), matching thread, toy stuffing. Finally found some more socks and so was able to make another sock giraffe and remembered to take photos for a tutorial this time, although I did rush a bit towards the end so the photos tail off a bit (oops), should be fairly self explanatory by then I hope. So here it is. 1. Find a pair of socks preferably with contrasting heel and toe. The size does not really matter, although larger gives you a bit more material to work with. The ones I have used here are a little on the small side. 2. Turn one sock (Sock 1) inside out and arrange so that the sock is flat with the heel facing upwards. 3. From the heel to the toe, mark the centre with pins and then stitch one side of the centreline then round to the edge of the sock before the toe as indicated on the photo. Repeat the process on the other side of the centreline. This will be the giraffe’s legs. 4. Cut between the two lines of stitches to separate the giraffe’s legs. Cut slightly beyond the starting point for the stitches to ensure you are left with a large enough hole for stuffing/turning the right side out. 6. This is where it starts to get a little more tricky. With the head section of sock two slide it into the body of the giraffe (sock 1) which should be the inside out. 7. Stitch around the opening to join the two socks together, this is quite fiddly. 8. The giraffe’s body is now attached to his head! At this point the giraffe will still be ‘inside out’, I’ve just turned to illustrate what you should have at this stage. 9. 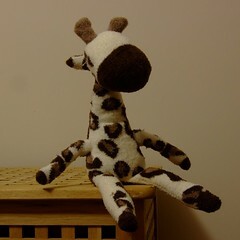 Arrange your giraffe so (s)he is face down, with the heel facing upwards and stitch from the head inwards and then out again on both sides to form a neck. You can cut away the excess material around the neck, but it’s not always necessary. Don’t make the neck to thin as you need to be able to feed the head through it when you turn it inside out. 10. Take your left over bit of sock 2 and stitch as illustrated to form arms and ears. Depending on the size of your sock you may also be able to produce horns from this bit of material. As my socks were a bit small I used scrap from another project for this part. 12. Turn the giraffe right way out through the hole in the crotch, start to fill with stuffing, as you fill try and shape the elephant as you desire. Fill the arms with stuffing and then handsew to the giraffe body at the point where the neck starts to form. As you attach the ears fold the head over so the head is facing forwards. Attach the giraffe horns to the head, close the hole in the crotch and stitch some eyes, I used small ovals of felt. Finally, send him/her to someone to love . 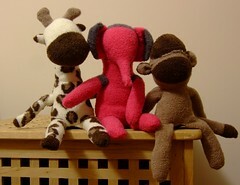 Please leave a comment if you have any questions or to show me a pic of any sock giraffes you have made. I’d had a hankering to make a sock monkey for a while. I’d found some socks that would be perfect a few weeks ago and finally made a monkey last weekend whilst watching the snow fall. He turned out pretty well, but the socks I’d bought came in a pack of two and I was left with a pair with a print that would be just perfect for a giraffe. So i made a giraffe. I’d fully intended to take pictures of the process and write down some instructions, but got carried away and forgot! 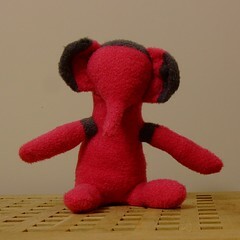 And then I spied some pink socks, and thought they’d make a nice little elephant. So I made an elephant but this time I remembered the instructions. 1. Turn one sock (Sock 1) inside out and arrange so that the sock is flat with the heel facing upwards. From the heel to the toe, mark the centre with pins and then stitch one side of the centreline then round to the edge of the sock before the toe as indicated on the photo. Repeat the process on the other side of the centreline. This will be the elephant’s legs. 3. Cut between the two lines of stitches sewn in step 1 to separate the elephant’s legs. Cut slightly beyond the starting point for the stitches to ensure you are left with a large enough hole for stuffing/turning the right side out. 4. Turn the sock the right way out, and you should have something that looks like this. The heel is your elephant’s bottom. 6. This is where it starts to get a little more tricky. With sock two inside out slide it over the body of the elephant (sock 1) which should be the right way out. The heel should be towards the top and facing the back of the elephant. 7. So both heels are on the same ‘side’ with the heel of sock 2 nearer the opening which you are now going to stitch around the edge to join the two socks together. 8. You should be left with something like this. I’ve turned it the right way round just to check the join stitching but this isn’t actually necessary at this stage. 9. Arrange the socks so the heels are facing upwards and stitch two lines from below sock 2′s heel towards the open end to form a trunk as indicated in the photo. You can ‘close’ the trunk at this stage, I opted not to as the socks I was working with aren’t particularly large and I wanted to make the trunk as long as possible which meant hand-stitching it closed at the end. 10. Turn your socks the right way round through the hole in the crotch. You may need to use a chopstick or similar to push the trunk through. 11. Find the piece of sock cut off in step 5, pin or otherwise mark the centre and and then stitch one side of the centreline then round to the edge of the sock as indicated on the photo. Repeat the process on the other side of the centreline. Then cut down the middle to form two arms. 12. Start to fill the elephant with stuffing through the crotch hole, as you fill try and shape the elephant as you desire. Fill the arms with stuffing and then handsew to the elephant body. Take the toes cut off earlier and attach to the head as ears. 13. Finally, use a whip stitch to close the hole in the crotch. Well actually, the final bit is the eyes but as you can see the elephant can’t as he doesn’t have any yet! One (not quite) finished elephant. Please leave a comment if you have any questions or to show me a pic of any sock elephants you have made.